A wide range of green building rating and assessment systems are used around the world, including LEED and BREEAM. Sustainability is now a top priority in MENA region and countries like Qatar and UAE have come up with their own green building rating system to incorporate socio-economic, environmental and cultural aspects in modern architecture. GSAS is billed as the world’s most comprehensive green building assessment system developed after rigorous analysis of 40 green building codes from all over the world. The most important feature of GSAS is that it takes into account the region’s social, economic, environmental and cultural aspects, which are different from other parts of the world. Several countries in the MENA region, such as Saudi Arabia, Kuwait, Jordan and Sudan, have shown keen interest in the adoption of GSAS as unified green building code for the region. Qatar has incorporated QSAS into Qatar Construction Standards 2010 and it is now mandatory for all private and public sector projects to get GSAS certification. GSAS combines 140 building sustainability assessment mechanisms and is divided into eight categories including urban connectivity, site, energy, water, materials, indoor environment, cultural and economic value and management and operations. Each category of the system will measure a different aspect of a project’s environmental impact. Each category is broken down into specific criteria that measure and define individual issues. A score is then awarded for each category on the basis of the degree of compliance. 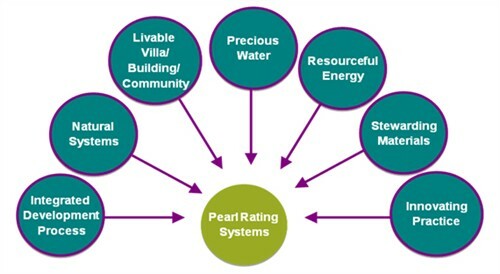 The Pearl Rating System is an initiative of the part of the government to improve the life of people living in Abu Dhabi, by focusing on cultural traditions and social values. The rating system is specifically tailored to the hot and arid climate of Abu Dhabi which is characterized by high energy requirements for air-conditioning, high evaporation rates, infrequent rainfall and potable water scarcity. Tagged Abu Dhabi, Architecture, ARZ Rating System, environment, Estidama, GCC, Global Sustainability Assessment System, Green Building, Green Building Rating System, Green Buildings in MENA, Green Buildings in Middle East, Kuwait, Lebanon, Middle East, Pearl Rating System, Qatar, Qatar Sustainability Assessment System, Resource Conservation, Saudi Arabia, Sustainability. Bookmark the permalink.